World T20 cricket: Are England in a spin without the IPL? England's capitulation to India in the World Twenty20 raised familiar questions over their ability - or lack of - to play spin. The issue rose to prominence in the Test series defeat by Pakistan in the United Arab Emirates earlier this year, while a Kevin Pietersen century was needed to prevent another loss in Sri Lanka a couple of months later. Stuart Broad insists England do not have a weakness against spin, but they are likely to be tested further during the Super Eights of the World Twenty20 starting on Thursday. Pietersen is currently out of the England set-up, with one of the main reasons behind his falling-out with the England and Wales Cricket Board his desire to play in the Indian Premier League at the expense of international fixtures. As it stands, the IPL clashes with the start of the English county season and England's early season schedule. Of England's 15-man squad in Sri Lanka, only Luke Wright, Eoin Morgan, Ravi Bopara and Michael Lumb have played in the IPL. But would England be a better side if more players had done the same? Players and coaches from nations such as Australia and South Africa are in no doubt that playing IPL cricket - and facing the best bowlers from all over the world in a concentrated period - has a positive impact on their national sides. Australia batsman Cameron White, who has featured for Royal Challengers Bangalore and Deccan Chargers, told BBC Sport: "The great advantage for our team is a lot of our guys have played IPL, just about all of our top six or seven batters. That's a great advantage on these wickets." While England were bamboozled by Harbhajan Singh and Piyush Chawla in Colombo, White believes Australia will know what to expect when they face the India spinners in the Super Eights on Friday. "Harbhajan, Chawla and (Ravichandran) Ashwin all play in the IPL, and a lot of our guys have played against all of those," he added. "We know what we are about to face; we are well equipped. There's no better preparation than playing on those surfaces against those bowlers. There's no doubt it's a good thing." It is a sentiment echoed by South Africa assistant coach Russell Domingo as his side prepare to face Pakistan, themselves armed with world-class spinners such as Saeed Ajmal, the highest wicket-taker in Twenty20 internationals. "We (India) have an advantage from IPL. We can take bits and pieces from what we've learnt in IPL and try to channel it in our performances." "It's a massive advantage having our guys playing against some of the top spinners and with some of them practising in the nets," Domingo told BBC Sport. "These conditions aren't as foreign to us as they were five or six years ago." India batsman Virat Kohli said: "It helps playing different bowlers from around the world. We [India] have an advantage from IPL. We can take bits and pieces from what we've learnt in IPL and try to channel it in our performances." Kohli also admitted to BBC Sport that India had planned to attack England with spin: "They have a good batting line-up, but we know they struggle against spin (in these conditions). So it was all about the spinners bowling in the right areas." Wright, who hit 99 not out in England's crushing victory over Afghanistan in the group stages, missed Sussex's first five County Championship games to play for Pune Warriors in this year's IPL, although he featured in just the one match. 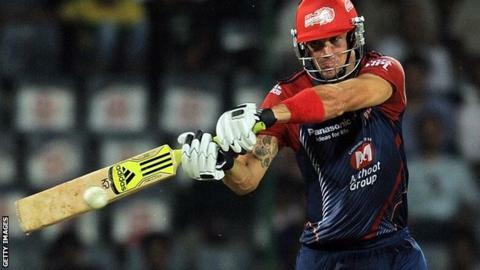 Kevin Pietersen, working as a television pundit during the World Twenty20, claims Wright's involvement in Twenty20 leagues around the world has improved his game. "I totally agree with his sentiments saying he's become a much better player because he's played Big Bash [the Australian domestic Twenty20 competition] and IPL when he's been out of the team," Pietersen said. Morgan has been on the books of both Royal Challengers Bangalore and Kolkata Knight Riders. Despite rarely featuring for either franchise, he believes the experience has been valuable. He told BBC Sport: "Having played a small bit of IPL cricket, it does expose me to sub-continent conditions and playing in front of big crowds." Is the IPL a 'crony league'? Read more on Is the IPL a 'crony league'?